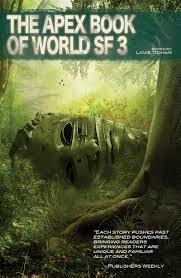 The Apex Book of World SF, because I couldn’t jam all my favorites into one post. “Jungle Fever” by Zulaikha Nurain Mudzar was a satisfyingly enjoyable horror story which starts with a scratchy plant. After reading this I’m going to wear garden gloves every day outside, even if I’m just watering the tomato plant! Sailin gets a scratch, which turns into a wound, which turns her into something else all together. this is not how she planned on getting revenge on her abusive uncle, but well, what are you going to do? As the disease progresses, she keeps enough of her mind to see what she’s doing, but it’s like she’s watching from outside her body. Since she doesn’t narrate the worst parts, either she’s in complete denial, or she’s so detached that she’s not aware of what’s happening in those moments, or she doesn’t want the reader to know the gross details of what’s she’s done. Someone has got to have a cure, but when she finds a physician, she’s terrified of what he might do to her. I appreciated that Sailin never became a mindless zombie. She might not be herself anymore, but the reader consistently sees her as a human, as someone deserving of our compassion. Or at least, we might be compassionate towards her so long as she eats someone else. . .